【LONG-LASTING BATTERY】: Build-in Rechargeable Battery lasts up to 3 hours. With this amount of playback time, you can enjoy your favorite movies on the go for longer. 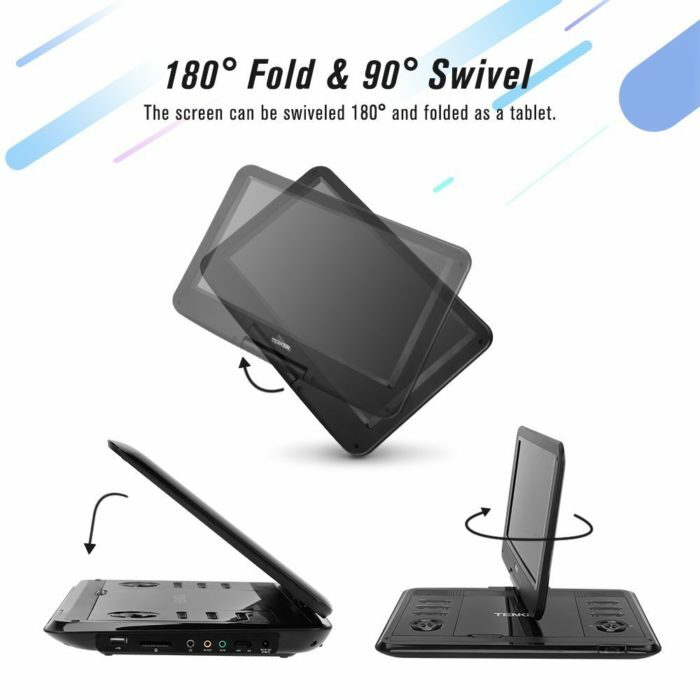 【SWIVEL SCREEN】: Rotates 270 degrees and flips 180 degrees for a great view from any angle. 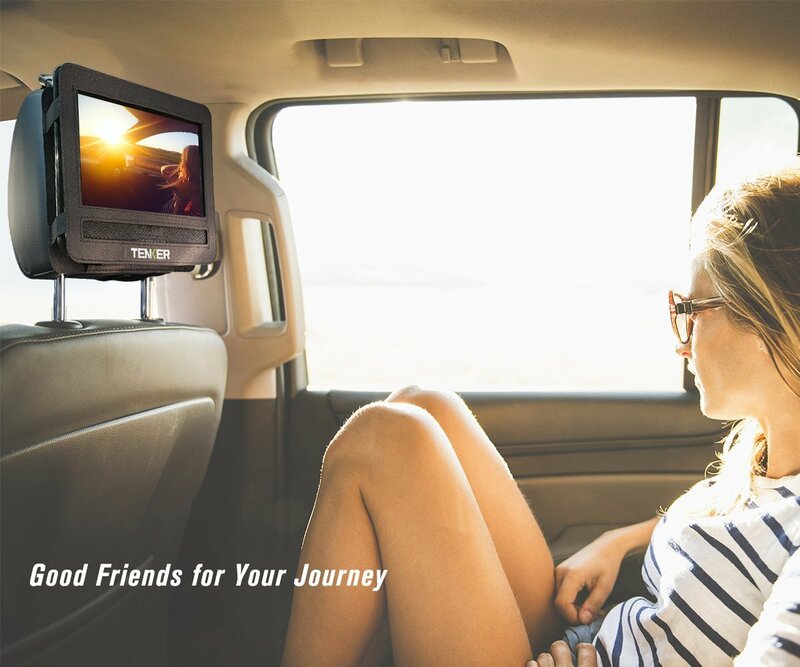 It can be flipped into a tablet style to enable you to attach it to a car headrest when you are on road trips. 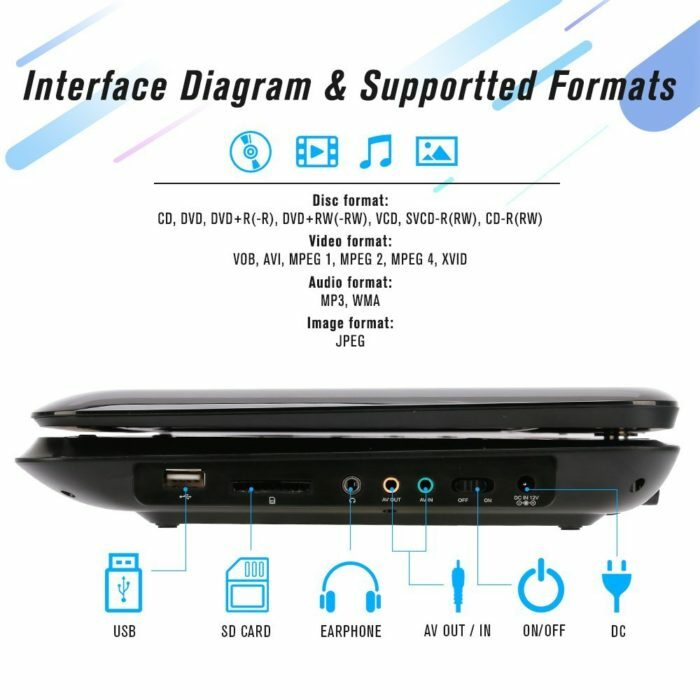 【USB & SD CARD PLAYBACK】: Equipped with a USB port and SD card slot, so that you can also easily enjoy your digital media. 【PLAY FROM WHERE YOU LEFT OFF】: The break-point memory function makes it more convenient for you to continue playing from where you off left last time. → 10 years’ experience of online business and 5 years’ experience in Portable DVD sales. → Great after-sales customer service, your satisfaction is always our highest pursuit. → Continual improvements, upgraded firmware and strict testing ensures we provide you with a better viewing experience. ► Leave your power cables at home! The improved 3-hour battery life and 1.7m car charger mean you can enjoy your favorite movies on the go for longer! ► The AV input & output means it can be used to connect the dvd player to TV via AV cable. ► Screen rotates 270 degrees and flips 180 degrees for comfortable viewing from any angle. ► We back this DVD player with a 12-month warranty and provide friendly, easy-to-reach after-sale customer service. ► This will be a good friend for your trip! 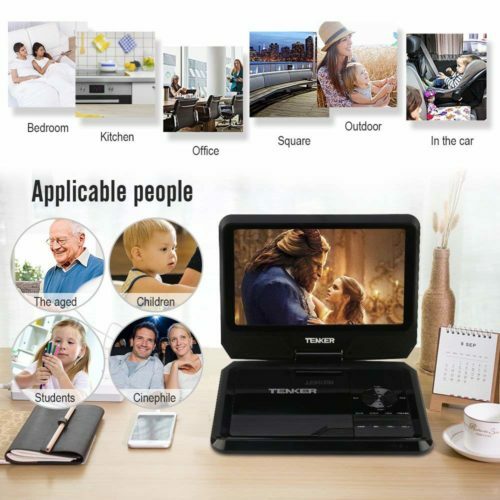 ► Order Your Portable DVD Player While It’s Still in Stock! Click ADD to Cart Now! Answer: From what I have noticed it will resume with some DVD’s, but not all. At least that is what has happened to me. The volume is decent if you are by yourself and with nothing else on. Question: Is there a film that needs to be removed from the screen? We received one with damage to the screen edge. I can’t tell if it’s a removable film. Answer: Yes, ours had film and the corner was lifted. I just pulled the film tab and the screen was perfect. Question: Blue tooth for headphones? Answer: Nope. Just a mini jack. Question: Does the wall charger also act as an a/c power source so you can watch a dvd while the “charger” is plugged in or is it only for charging the battery? Answer: Yes, when player is plugged in, player also could work. Question: Can you use earphones with device? Question: does this play audio cds? Answer: Attached is format supported for your reference: CD, DVD, DVD+R(-R), DVD+RW(-RW), VCD, SVCD(RW), CD-R(RW). Question: what type of batteries does the remote control take? are the batteries included with the player? Answer: Battery for our remote is 2pcs AAA battery, they are not included in player parcel for security consideration. Question: I’m assuming you can plug headphones in to this dvd player? can you plug in more than one? 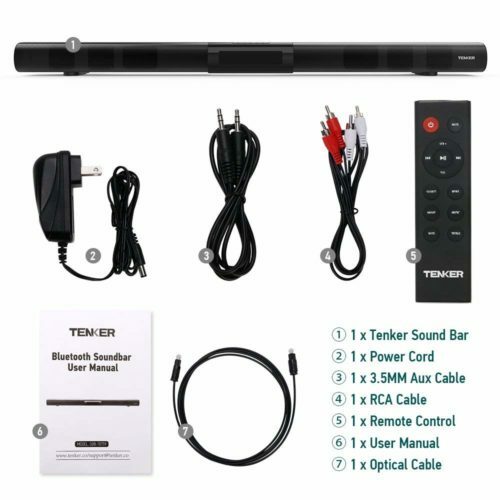 Answer: If you want to use more than one set of headphones, this DVD player has only one headphone jack, so you will need to buy a splitter to use more than one set of headphones at the same time. A headphones Jack splitter is incredibly inexpensive and easy-to-use. Question: Does it come with plugs for car and regular wall power? Answer: There has car charger and wall charger in player parcel. Question: What is the actual size of the screen? Answer: For 9.5 inch, screen length* width*diagonal is 19.5*11*22.5cm. Answer: i don’t know. i do not own any blu-ray disks. Question: will this player play GIF files? Answer: Our player does not support GIF files. Answer: About 8×4 and a half. Question: What kind of adapter does this use? Question: Does it play when its cold? Our last portable player would not. Answer: I haven’t tried it when it has be really cold so I’m not sure. I haven’t had any other problems with it though. The coldest it’s been I would say would be in the upper 40’s or low 50’s but when I brought it in I didn’t have an issue. Customer Review: Great Product, Great price! Perfect for your workout DVDs!!! Immediate and easy use of the DVD player right out of the box and it comes with a hand remote which is a plus! I also like that the company covers most issues regarding the product with a 12-month warranty which you must register within 2 weeks of receiving the product and also a 90-month return policy including free shipping. This product will be great for my 5 am morning workouts because I can take it to any room of my home and begin my workout routine without disturbing my family. You can also take it with you on travel due to the product casing is extremely light in weight and the monitor size is absolutely perfect! You can’t go wrong with this purchase. I tested the product with folders on the DVD, after a while I found out how to select folders on the DVD and USB. I found out the player using the DVD plays MP3 music according to the file name. The USB with MP3 files you can select folders, but the player plays the files in random order. The Jpeg files plays in order on the USB. The MP4 files doesn’t play the video portion. The big reason I bought the player is that it plays VCR format disk. I would recommend buying this player if you can live with the random playing of MP3 on USB and only the audio portion on MP4 files. I should also mention the sound of the player is very good. I also bought the 9.5 screen to use playing MP3 through a Bose radio. I was leery about buying a brand I didn’t know, but I was super pleased with this. The picture is good, the sound quality is great, the screen is huge. I was looking for a spare dvd player for my kids to watch their school videos and this surpassed my expectations. Works great but won’t play certain dvd. It needs a password which i never put on the device. (Edit) someone reached out from Support to assist me with the DVD player. Works perfect. Best one he has ever had. Ease of use was remarkable. Reproduction quality was above what you would expect from a player this small. Great DVD player – I use it everyday while I exercise. Shipped quickly and efficiently. Easy to use, good picture, nice product. Thank you! Overall this is a good player but the power cord is very thin and is at the point of breaking. Also the lowest setting on the volume is a little loud. Otherwise its a good player just thicken up the power cord. Learn from my mistakes so you don’t waste money. Changing my review because the company rectified the situation. The dvd players do work well. The kids easily figured out how to use them. Perfect size and easy to take places. It is the perfect size to be easily taken places and is easy to use. I bring an exercise video with us when we go to take care of our granddaughters and while they nap I’m able to use this and get my exercise done. This summer we’ll take this with us on vacation so I can use it and we can let the grands watch videos. 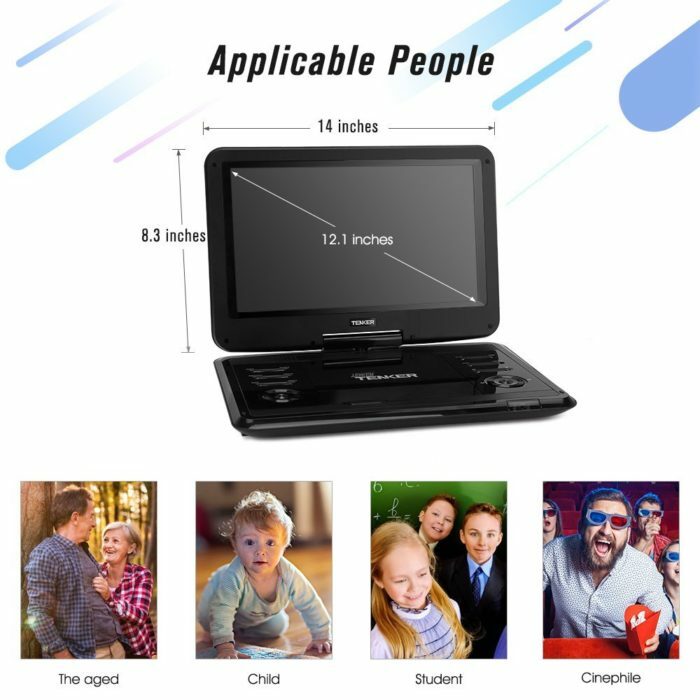 A little pricey for a portable DVD player these days but picture is great and the size of the screen makes the price worthwhile. Arrived nicely packaged and early. Gave this player as a gift. As far as I know they are happy with it. I bought this for my daughter’s Christmas gift and it has already malfunctioned. She has had it less than 2 months! It will not charge when plugged in. This is very disappointing hopefully it can be fixed….Problem fixed very quickly! I Rarely Write Reviews, this DVD player deserves a great review. I wanted a DVD player so I could watch and exercise to my yoga DVDs any place. I had no idea what was available other than small units designed for kids. 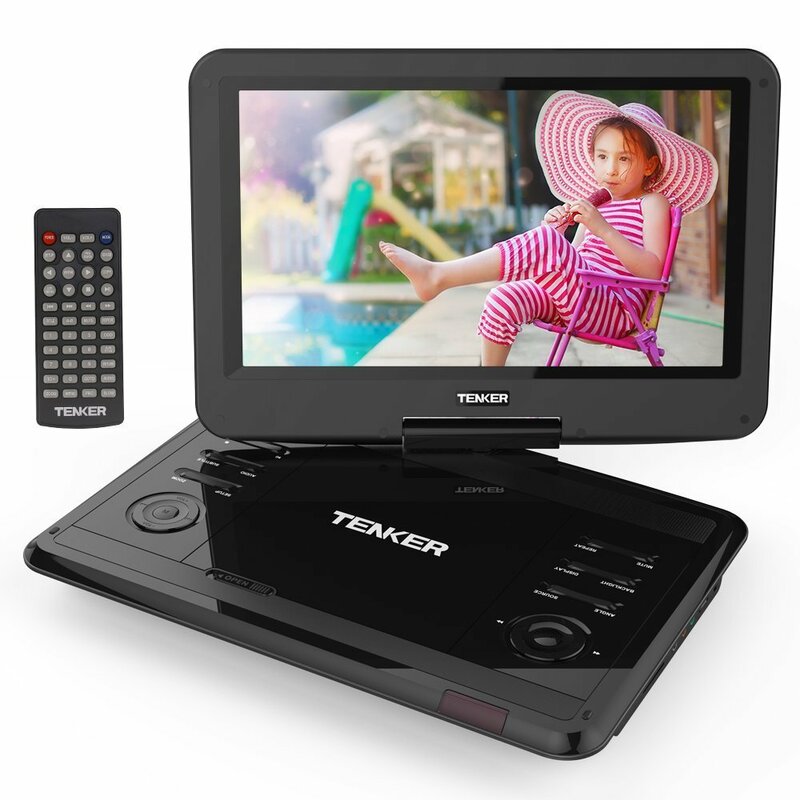 I had just about given up looking as most sounded flimsy and were small and then I came across the Tenker 12.1″ Portable DVD Player. When it arrived I wasn’t impressed with the Amazon packing, bubble sheets in a big box with the Tenker box loose inside. But when I got the Tenker box opened I was very impressed. It was extremely well packaged which told me the company cares about their product. Bubble wrapped and the screen covered, everything covered for protection. Set up was easy and I am very happy with the quality of the picture. Plenty of adjustments to get the picture just to my liking. As a middle aged woman I want a great picture and simple to use is a must. Sound is good too. Very impressed, Thank You Tenker. 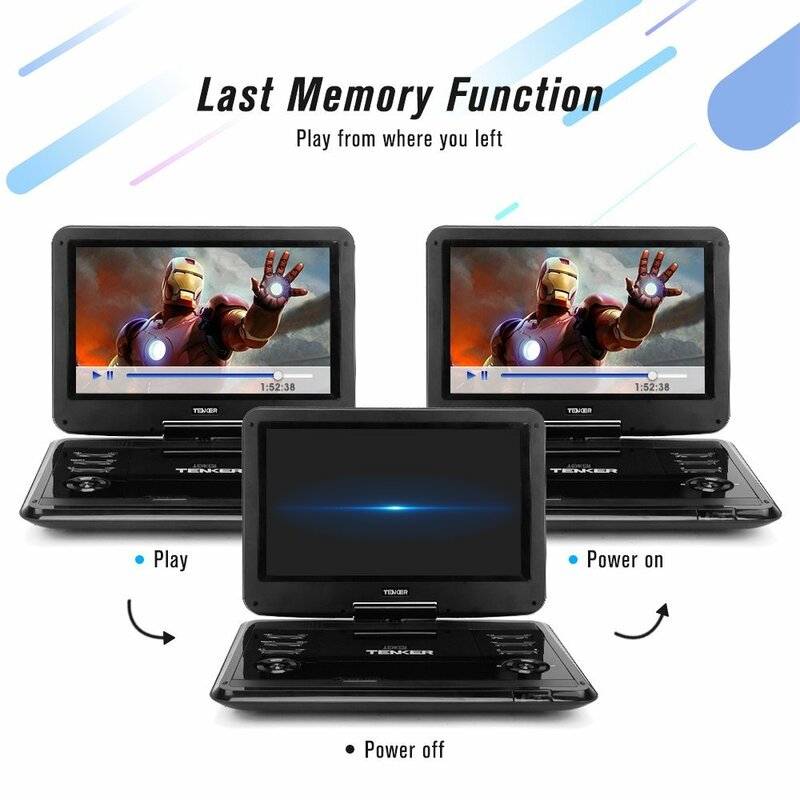 This is a great portable DVD player! It has a pretty big screen (bigger than I anticipated), with easy to use buttons, and a swivel screen. There’s also a small plug for earbuds. I haven’t had any problems with it after using it for more than a week. This is great for long car rides and days where the internet is slow. Great purchase definitely recommend!! This kind of machine is really good for my baby, I can buy some saucers and put it back. When the early teaching machine is used, it won’t hurt the baby’s eyes too. I bought this portable DVD player for my brother who is “technically challenged”. He wanted to be able to watch DVDs on the go with simplicity. This product has operated easily and well for him. The DVD player does the job perfectly! The screen image is superb, so clear and sharp! The volume is great, , The fact that you can watch DVDs whilst the player is charging is great (apparently that’s not the case with all DVD players). Really easy to use, love it! 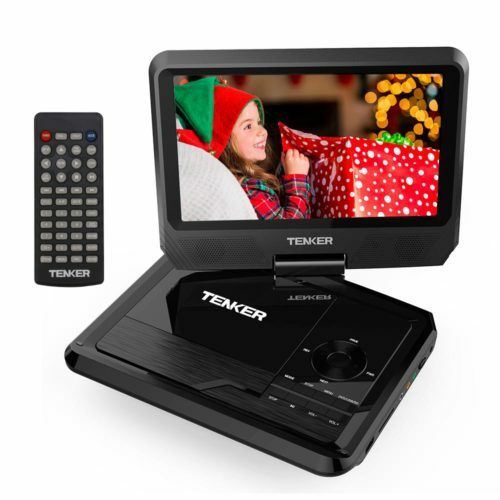 The Tenker Portable DVD Player is easy to use, you can carry it around almost everywhere including your car. 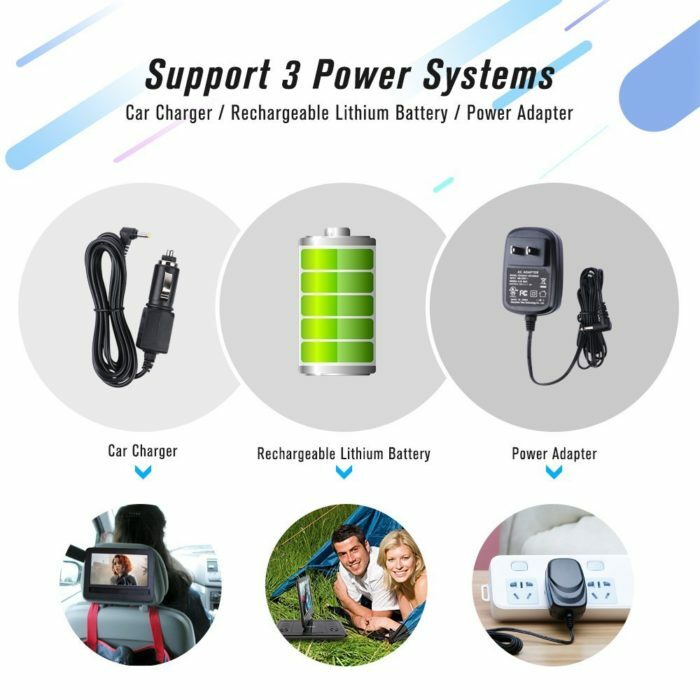 It has a special charger that can be used in the car, so it has two chargers one for inside the car and one for outside of the car. My kids are always loud in the car so when I put a DVD in for them in the car they quiet down and watch the DVD. 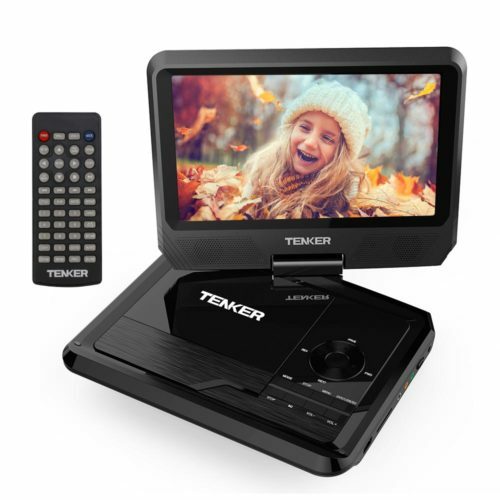 The Tenker Portable DVD Player can turn around with the angle of 360 degrees. So you can flip it around so that if you have it in the front you can flip the screen so the kids in the back of the car would be able to see the screen. It is truly a magnificent device to use. Especially it quiet down your kids. first electronic prouct.high quality of visual presence and the material is of good functional. can be controlled with the small machine. It is tiny designed look make it so adorable while can enjoy the film. Great entertainment intrsument for traveling, the kids like to watch it while sitting in the car. I bought this DVD player w the large 12.1″ screen because I wanted to use this for our schoolwork DVDs. I have two kids who use the same DVD programs and sharing one big DVD player works best for them. The set up is really easy and with a remote, I can control the video from across the room. Very convenient. Perfect for us! We lost some of the cords to our old portable DVD player so we started looking for a new one. We knew this one would be quite a bit bigger but it wasn’t until it got here that we realized just how big it was. 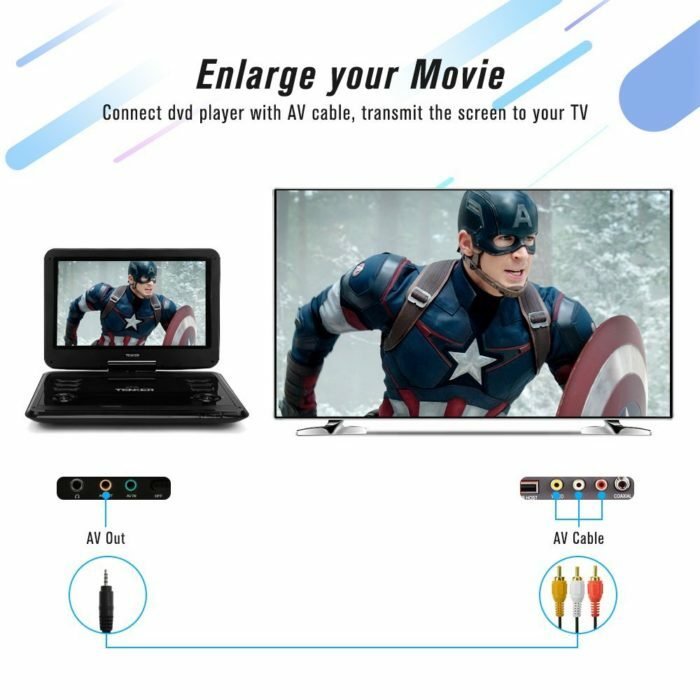 It’s a nice size for watching movies but still small enough for traveling. Comes with a remote, wall plug, and car charger. My son was very excited to get it for Christmas. This is a great DVD player and super easy to use. This is important to us because not only do we have kids, I have a husband ( who is not tech savvy) who is using this for workout videos. It is very “Plug and Play” and comes with all the accessories that I would expect. I was actually surprised that it comes with a car charger given that a lot of technology today make you buy a lot of those pieces separately. This is a bit on the larger side but it’s still pretty lightweight. This was a family gift and will be very useful on car trips with grandkids!. I like the swivel capability as everyone will be able to watch their favorite movies!! This was an early Christmas present for my son, was given before a long car ride to grandma’s for Christmas. Worked great and saved me from answering “are we there yet?” a thousand times. The screen size is great, it was easy for him and his younger brother to view at the same time. When I opened the shipping box I was pleasantly surprised how cool the packaging was. It is really nice! I thought this would be a cool gift for someone because it is just packaged very nicely. Once I got the DVD player out of the box I realized this thing is HUGE. It is very big. The picture quality on it is great! It is like watching a movie on a laptop. With this sad, I wish I had gotten a smaller one because I was looking for something my kids can take on long car rides to keep entertained. We don’t think we’ll be using it for car rides because it is too big for them to hold while in the car. However, we will definitely use it at home for our kids to watch their cartoons and leave our laptops alone 🙂 I love that it came with a remote control! We ordered this for a long road trip with 3 kids. It was easy to use, clear picture, and worked perfectly. Great product for the price! I ordered it to make the car rides with my kids less crazy. When I first opened the package I was impressed by the size it was and how big the screen itself is. When we turned it on the picture quality was perfect and it’s very easy to use. I’ll give it an A + in my books. 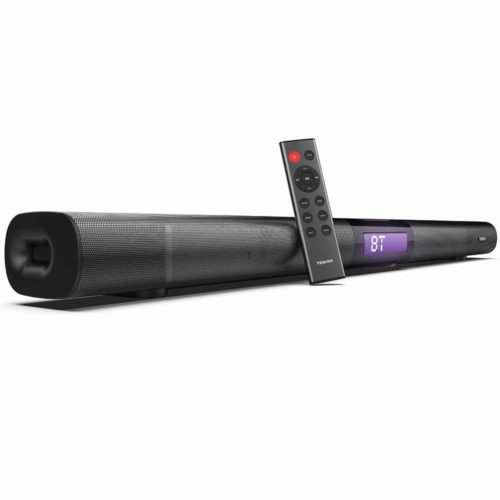 Image and sound are excellent, you can work continuously for 3 hours.